To say the least, you are facing a very difficult time. 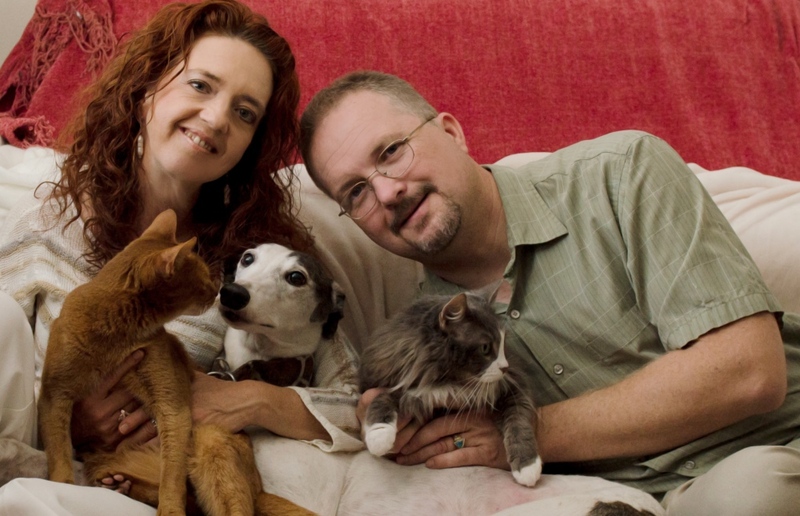 For most American families, pets are an integral part of the family. The idea of seeing them go is very painful and the moments spent discussing the subject and options appear through a blur of tears. The purpose of this article is to lay out the different choices that you have so that you can go over them in your own time, at your own pace. You have important decisions to make. It is important that you take the time to consider all your options. Doing so will likely avoid future feelings of guilt and regret and you can be at peace with your choices. A rushed decision or a decision made with partial information due to heavy grief occluding your conversation with your veterinarian is often a decision regretted. If you choose t he avenue of taking your pet to the hospital for euthanasia, first, you may want to ask the hospital staff for an appointment time when it is likely to be more quiet, perhaps at the very beginning of the day or at the very end of the day. Some veterinary hospitals have trained their staff to schedule euthanasias during a quiet time. However, given the unpredictable nature of illness, it is not always possible to predict a hospital’s “quiet” time. It is likely that your veterinarian will require a consultation to ascertain that it is time for euthanasia and that other avenues have been exhausted. After the consultation, you will be asked whether or not you want to stay with your pet for the euthanasia. This is an important point to consider. Some people are emotionally not capable to witness the euthanasia itself. Some hospitals have special rooms to make the euthanasia easier. Photo courtesy of Advanced Veterinary Internal Medicine Your veterinarian may or may not sedate your pet. This is an option that should be discussed so that you know the pros and cons of sedation prior to the euthanasia. If sedation is opted for, and if you have decided that you do not want to stay for the euthanasia itself, you still have the choice of staying with your pet after the sedation has been administered and until your pet is comfortably resting or sleeping. This may take as little as a few minutes and up to 15-20 minutes depending on the drug used and the condition of your pet’s internal organs. Then, your veterinarian will take your pet to the treatment room and will insert an IV catheter into your pet’s leg to ensure that the final injection is properly administered. Some veterinarians will place the IV in the consultation room with you present, at your request. In some facilities, this may not be possible due to technical reasons (lighting, personal preference, etc...) Some veterinarians prefer to use a direct needle for the injection of the euthanasia solution which does not require the placement of an IV catheter. Some hospitals have special rooms to make the euthanasia easier. Photo courtesy of Laguna Hills Animal Hospital The final injection takes only seconds to take into effect and after it has been given, the doctor will listen to your pet’s heart to make sure that he has passed away. You will likely be given the option to spend a few moments with your pet before leaving. It is wise to request that all paperwork and payments be done ahead of time so that you can leave when you want after the procedure and you do not have to wait at reception and take care of paperwork and payment details at a moment when you will likely experiencing heavy grief. The main reason for choosing an in-home euthanasia is that it will be more comfortable for your pet, less stressful and that he or she will have a dignified departure in the comfort of your own home. You and your family will also be able to grieve in the privacy of your own home. This terribly difficult and emotionally painful moment can be made a more comfortable, more peaceful experience for your pet, you and your family. 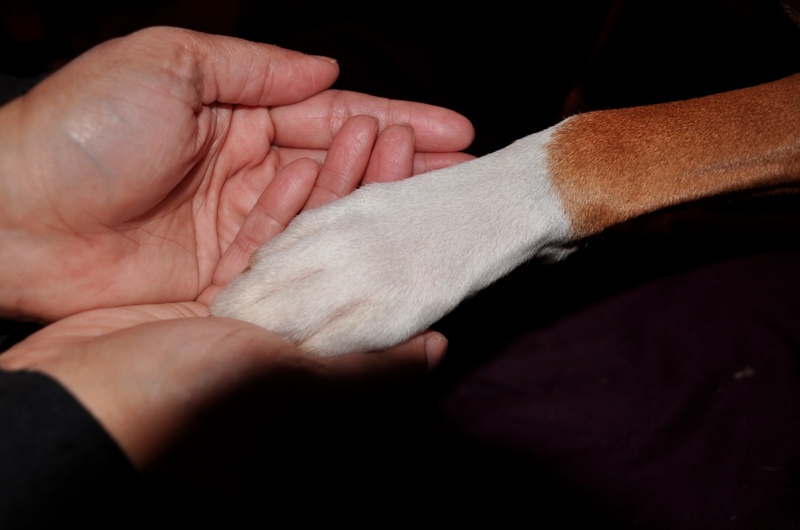 Some people even report that having the euthanasia done in-home made such a difference that they didn’t have to forget their pet’s last day and that it made this most difficult decision and experience of pet euthanasia one that they can remember as a special moment and a good memory, rather than one that would diminish the memory of their family pet. Most pets don’t like to go to a veterinarian’s office. They are scared, anxious. Some of them don’t like to go in the car. For some, especially arthritic or cancer patients, it will not only be unpleasant to be lifted in and out of the car, but also painful and possibly degrading. You now have the option to say goodbye to your pet at home in his or her own surroundings and avoid having your pet spend the last moments of his or her life in a place that is dreaded and where unpleasant moments have been experienced. The procedure for the euthanasia is similar to what is described above in the section discussing the in-hospital procedure. Sedation may or may not be opted for depending on pet’s comfort level and circumstances; the IV will then be placed; you will be given as much time as you wish prior to the final injection and you will be given as much time as you wish to say your goodbyes after the euthanasia and before your pet’s body is transported into the doctor’s vehicle for the aftercare. Euthanasia at the beach The difference is that it will be done in familiar surroundings. The location of the euthanasia can be selected by you, your pet and your family. It can be done under a favorite tree, in the backyard, on a favorite couch or bed... virtually anywhere within reason, even at the dog park or at the beach. The important thing is for your pet to be comfortable and for you to be able to hold him or her the entire time if you wish. Opting for an in-home euthanasia does not mean that you are obligated to witness the entire procedure or any of it. You and your family may be present for all of the procedure, part of it or none. It is your choice. 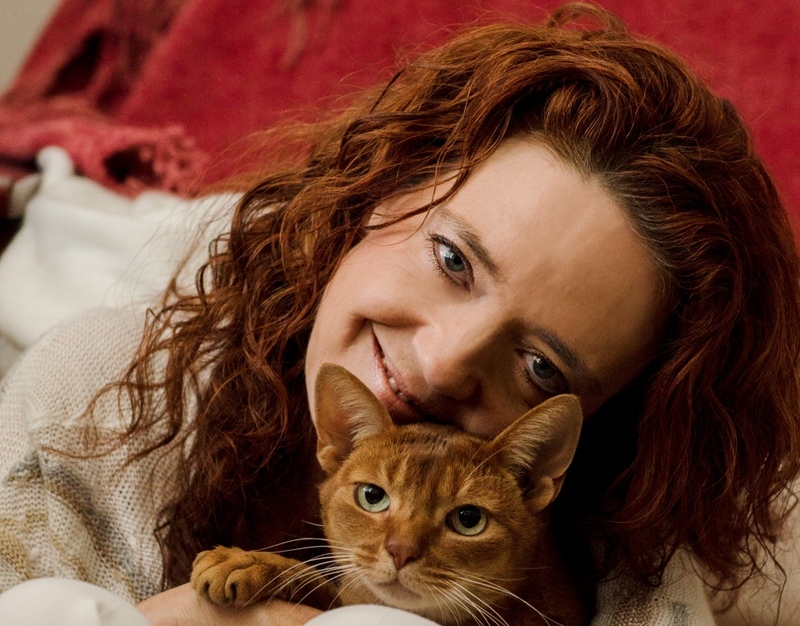 Regardless of whether or not you decide to be present is to know that your pet will be comfortable and happy. When you make arrangements with Home Pet Euthanasia of Southern California to have your pet euthanized for humane reasons, you will be given some forms to fill out (see forms). You may download the forms and have them ready ahead of time in order to minimize the technicalities at the time of the visit. Please see the page Pet Euthanasia Forms on this website. If you don't get around to fill out the forms ahead of time, it is fine. We always bring a set of the forms and you may fill them out when the doctor first arrives at your home. They are available on this website strictly for your convenience so that you don't have to be bothered with paperwork at the time of the visit. Once the preliminary injection has been done (if sedation is warranted), the doctor will insert an IV catheter in your pet's leg so that a secure access to a vein is granted. An IV catheter is not a big IV hook up with a line and bag: it is simply a small needle that gets secured in place on your pet's leg. It is only as painful as the prick of a needle can be. If no sedation is necessary for your pet, the IV catheter will be inserted with your pet lying down comfortably. Depending on your pet's disposition and the level of pain his condition is causing him, sedation may or may not be necessary (see "Use of sedation"). Very rarely, a muzzle may be necessary so that he or she will allow the doctor to give him or her the first injection. The reason for the IV catheter is that it is important that the final injection goes intravenously and that the needle doesn't slip on the side of the vein because the product can burn if the needle slips. With the IV catheter correctly in place, it is impossible for this to occur and your pet will not have to be held still at the time of the injection. 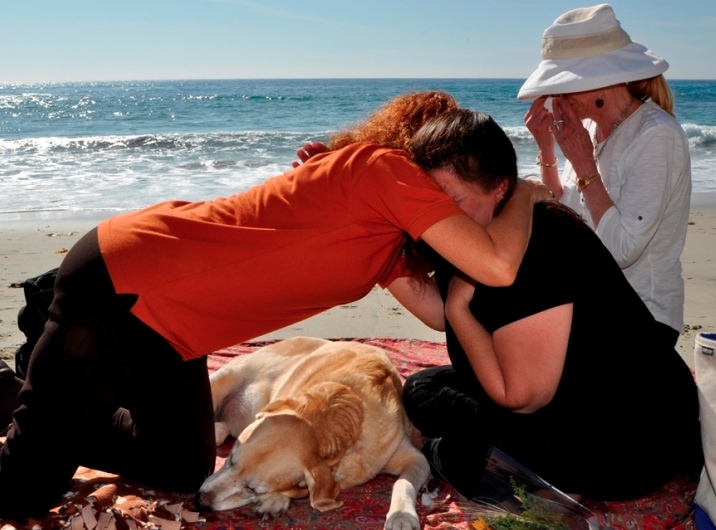 It makes it more peaceful and it makes it possible for you to hold your pet at the final moment. It takes only a few seconds for the euthanasia solution to take effect. This solution is basically an overdose of anesthetics and causes first complete unconsciousness and then the breathing and heart to stop. It is as painless as being put under anesthesia. Within a few seconds, your pet will be unconscious. It may take a minute or two for the heart to stop. The doctor will listen carefully to your pet's heart to ensure it has stopped before pronouncing him or her gone. After that, there is no danger of your pet waking up. This is a very common fear for pet owners. What if he wakes up a long time after? Have no worries, with the current products used today and the careful auscultation by the veterinarian after the injection, this cannot happen. 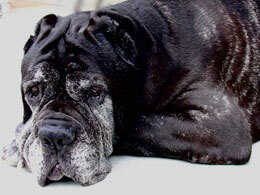 Occasionally, some muscle twitches might occur after the death of a pet. In the rare instance that this may occur, be assured that your pet is gone by that time. Pet owners are sometimes startled and upset at the sight of those post-mortem nerve twitches, but please be assured that it is not abnormal and that the pet is actually gone when that occurs. It does not always occur but if it does, I want you to be prepared. Those twitches may rarely include what seems like a deep breath but is, again, only a post-mortem reaction. Another thing to be aware of is that your pet's eyes will likely not close after he has passed away. For a full description of the possible manifestations of death, see "Understanding Death".